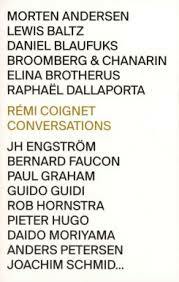 I've spent some evenings the past week with Remi Coignet's Conversations, a recent book of interviews with contemporary photographers from all over. I've always enjoyed the dialogue format and this one is an interesting read, with good conversations throughout. My one slight gripe is that the chats lean heavily on the topic of photobooks. I guess that makes sense because it's, well, a book by an author. So by definition the subject of books is near and dear to Coignet. Just as it might be natural for film directors to make movies about budding film lovers, or orthodontists to steer conversations to crooked teeth, authors are into books. That's why there are so many stupid books about becoming a writer. Remi Coignet: I would like to talk about your books. You have published about 200. Why is the book so important in your practice? Daido Moriyama: The most important thing for me, before making books, is taking pictures. My life is all about taking photos. I possess the energy to take photos. So it is pretty normal if a lot of books come out of it. Remi Coignet: Yes, but I was under the impression you gave more importance to books than prints. Daido Moriyama: …for me a book is a time to think. Clearly it is very important. And so on. I think Daido would rather talk about making photos. He leaves the door open, and if pressed the conversation might go somewhere fun. But Coignet will have none of it. For him it's books, books, books. The other interviews follow suit in a similar vein. JH Engström, Pieter Hugo, Paul Graham, etc. Any bookmaker would put good odds on their next book being well made. But what about photomaking? Coignet's tunnelvision is a sign of a wider syndrome: everyone in photography wants to talk about photobooks. Some have labeled this "the golden age of photobooks". Others say it's not. I don't know about either claim, but it certainly could be labeled the golden age of photobook commentary. Over the past decade or so, the metaworld of pundits and educators has been pulled strongly toward photobooks. Every December the various photobook lists are published online. At this point "photobook of the year" is a rough equivalent for "photographer of the year". Then come the lists of the lists. (Photolia, Andthewinnersare, Ohtopbook, HAFNY, Don't Take Pictures, Streetshootr, etc) Then comes the whining about the lists. Then the whining about the whining. Then the whining about the lists of lists of lists. You need a bookie to keep track of it all. Oh well, self referentiality has always been a hot ticket in the art world, and the photography ghetto is no exception. Photographers enjoy self-reflection. But why is the object staring out the mirror always a photobook? The phenomenon extends beyond end-of-year lists. LPV's podcast has been revamped to focus on photobooks. Concientious has transformed from wide ranging commentary primarily into weekly photobook reviews. Collector Daily, which once focused on New York exhibitions, now gives near equal weight to photobooks. Aperture slips a Photobook Review into every other issue. MFA programs —typified by Hartford's limited residency program— are oriented increasingly around the photobook. And so on. I realize photobooks have been around forever, but the increased focus on their importance seems to me very contemporary. On Thursday I caught Christian Patterson's entertaining talk at the University of Oregon. Patterson might be considered Exhibit A in the shift to photobooks. He began as a protégé of Eggleston in the straight documentary mold. See the world. Capture it. Repeat. But over the past decade Patterson's focus has shifted to long range projects realized in book form. Redheaded Peckerwood is a brilliant book. But it's not a book of photos. It's a Photobook, capital P. Patterson spent weeks in Nebraska tracking down subjects, and he made many of the photos which eventually appear in the book. But his photos were means to an end, minor elements in the larger project. The bulk of his energy went into research, forensic study, editing, and generally constructing the final form of the book over a five year period. Fond Du Lac continued in a similar vein. Patterson spent just a few days making photos. This was followed by years of tinkering and editing to get the thing just so. 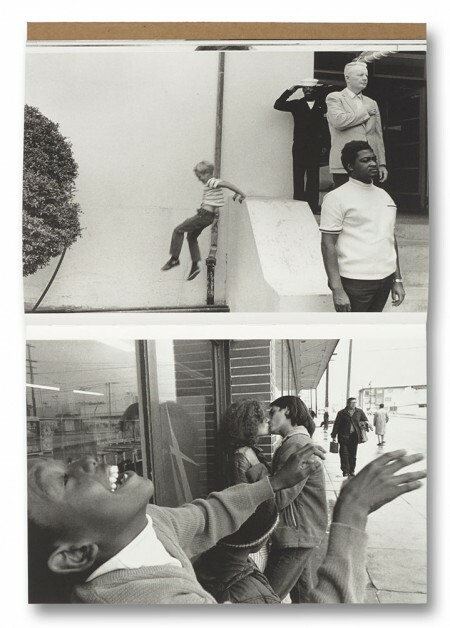 For Patterson making photographs is an art tool, not a revelatory action in and of itself. For him, the book is where the revelations come. If you're a young photographer tuned to all of these information streams, you might think the primary goal in photography is to make photobooks. And for some it is. But in the rush to make photobooks, an alternate photographic path has gotten short shrift —the mere translation of the world into pictures. This is the path of Sommer, White, and Callahan, not to mention Eggleston. Like those towering figures it might be viewed as old fashioned or crotchety or passé. But it's still a valid path, and done well it can be as satisfying and meaningful as bookmaking. I'm not anti-photobook. I love looking at them, thinking and writing about them. They're often the best vehicles for photographic presentation. But I think a photobook can sometimes come at the end of the image-making process, and not always be injected from the start. That order has largely fallen out of favor, as many photographers embark on projects now with some vision of a book guiding decisions during image-making. This image will go near the start. That one is a two-page spread. I need image X to fill this sequence. Etc. Making photos becomes a process of marking off items on a checklist, and the photographs are mere pawns in the larger effort. A step-by-step checklist is a fine way to make a book. It also works quite well for building a model airplane or replacing a deadbolt. But what about the other way? What about photographs coming first? I used to have a quote on my website, Shoot First, Ask Questions Later. This means let the photographs steer the ship. Let them push the agenda. Photographs found in the wild are like rare flowers. The hunt can be wonderful! Who knows when you might find one or where it might lead? I think this is what Daido Moriyama is talking about in the quote above, and it's what Richard Benson is referring to in this panel discussion with Lee Friedlander which has circulated online recently. "One of the things we're all sad about," says Benson. "is that photographers don't walk around with a camera all the time and photograph without a project." Hallelujah! Sitting right next to Benson is the patron saint of Shoot-First-Ask-Later, Lee Friedlander. His practice is to shoot whatever interests him, then figure out afterward what the photos mean and which piles to put them in. Ironically, Friedlander is a prolific maker of photobooks. Photobooks are important to him, his main mode of expression. Most of his photobooks are wonderful. But I don't think any of them were conceived before he made the photographs they contain. Sometimes you get the opposite outcome. Ken Graves made many brilliant photos in the seventies with a shoot-first-ask-later mentality. When they were finally compiled into a photobook decades later —2015's The Home Front— the result was horrible. The form of the photobook stifled the photographs. There are no guarantees. "The broader art world has no problems with the work of Jeff Wall, or Cindy Sherman or Thomas Demand partly because the creative process in the work is clear and plain to see, and it can be easily articulated what the artist did: Thomas Demand constructs his elaborate sculptural creations over many weeks before photographing them; Cindy Sherman develops, acts and performs in her self-portraits. In each case the handiwork of the artist is readily apparent: something was synthesized, staged, constructed or performed. The dealer can explain this to the client, the curator to the public, the art writer to their readers, etc. The problem is that whilst you can discuss what Jeff Wall did in an elaborately staged street tableaux, how do you explain what Garry Winogrand did on a real New York street when he ‘just’ took the picture? Or for that matter what Stephen Shore created with his deadpan image of a crossroads in El Paso? Anyone with an ounce of sensitivity knows they did something there, and something utterly remarkable at that, but... what?" But curatorial bias is only a partial explanation. I think there is also some generational bias against gleaning. The carefree 1970s of Friedlander's heyday are long gone. Taking its place is a 21st century is of packed schedules, amplified social stratification, and roughly 3 billion photographers. It's a rat race. A day spent searching for unplanned photographs occupies the roughly same place in society as a day of fishing or panhandling. There may be a place for it, but only among the idle or unambitious. The upwardly mobile set —and that includes the art crowd— believes in controlled time. To wander for hours searching for the unknown requires faith. One must trust that unmarked time spent photographing will result in the world revealing itself, and that your translation of the world will be meaningful. That's a tough mindset to maintain, because sometimes photos happen and sometimes they don't. And all the while the metaworld is screaming "Books! Books! Books!" For making books, projects rooted in ideas are perhaps more reliable image generators. Is it any wonder the faith has waned? The one place it is strong is in street photography, a genre bogged down with preconceptions. The faith is there, and maybe even a spiritual component, but both are too often channeled into religious dogma. If you've spent much time reading B, none of this will be new. I try to focus my interviews around the old fashioned practice of making photographs. In WWHT? I focus on the moment of perception and exposure, because that's what I'm most curious about. I make photographs, so I'm naturally interested in how other photographers make photographs. Making photobooks comes later. This is one of the best posts on the site, which makes it easily better than anything else on the internet. Thanks for providing the antidote, Blake. Great writing and perfectly on spot, thank you! Very good post, I've also been wondering about this trend in photography and how it seems to be affecting the actual process of making a photograph in a fundamental fashion. Brilliant post Blake, thank you! It seems though that you have a soft spot for the excess of photobooks by acclaimed photographers that come later in the process. It's the syndrome of wrapping up in a book every single series they "once" worked on - not to say every single frame - even if that series was not conceived as such in the beginning of the process. Moriyama, Eggleston, Friedlander are examples of such proliferation. On a different note, I would like to ask you why you are dissapointed by Kenneth Graves' book. I don't have it but I was thinking to buy it. It's a retrospecive monograph wrapping up his most iconic shots I suppose. What else could have be done with that? Perhaps having been more focused on a theme? What you didn't like about it? Thank you for articulating this issue so well. Sometimes I feel that this trend also may be yet another way for ambitious photographers to escape insecurity regarding the validity of what they are doing by gaining acceptance in the art world, which relates to the age old question of whether photography is art (implying of course that the stamp of art is the stamp of approval and validity). I would have thought that question was dead and buried a long time ago, but it is just a kind of flip side of your note that photographers have lost faith in just making pictures of the world as it appears to them. Zizis, you ask about Kenneth Graves' book. Of course I am not Blake, and his opinions of The Home Front may be very different from mine. But FWIW although I'd been looking forward to the publication of The Home Front, once I saw a copy I had no desire to buy it. As you page through the book, its spine does not run more or less parallel to a line running forward from you (like a conventional book). Instead, it runs more or less perpendicular to this line. I'm not sure why I always find this design extraordinarily annoying, but anyway I do find it so. The reproductions "accord with a zine aesthetic" (if you want to be flattering) or "are poor" (if you don't). Sorry, I don't now remember how they're poor; I just remember thinking "Meh!". Though it's a paperback with poor printing, pricing does not accord with zine pricing. It's expensive. 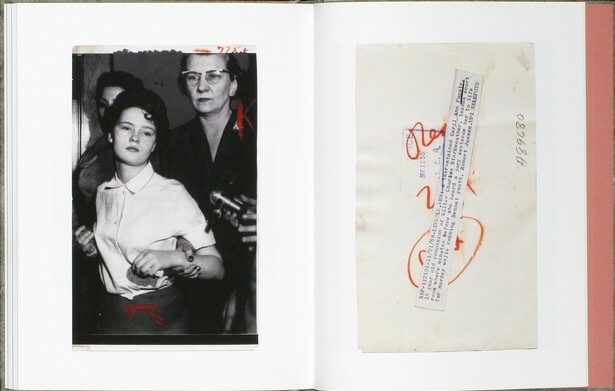 Steidl could have printed the photos in tritone, bound it the right way around as a hardback, and put out the result for a lower RRP. OK, this is in part because Steidl makes its money off publicity for Lagerfeld's frocks, etc, so perhaps the comparison is unfair. Well then, Powerhouse or Dewi Lewis or Actes Sud (just as the first names that occur to me) could have done a better job for a lower RRP. Always insightful to read. Another great one Blake. Well for 'photography artists' to get funding for books, many need to have a lengthy artists 'rationale' behind the work first rather than just being a collection as such, which would be the traditional 'photographer' method. I think this has a lot to do with it. The majority of the Magnum photographers may just have a vague theme of the location at most. I think it comes down to artists who use photography tending to think in terms of books, and general photographers. Thanks so much for writing this, Blake. I photograph entirely in the shoot first, ask questions later mode, but over the last year or two (during which time I spent more and more time looking at photobooks and reading writing about photography concerned largely with photobooks) had grown entirely insecure with that mode of working, feeling as if I was not doing something right, that I had nothing really to 'say' about the world I was photographing or even say what drove me to photograph the things I did. The things I've been reading have only exacerbated this feeling of inadequacy. I mean, I love Alec Soth's work, but it's a little dispiriting reading him say things like (while talking to Francesco Zanot about Brighton Picture Hunt, where he edited a book of photographs taken by his daughter) "... my daughter can do a museum quality exhibition of commissioned photographs. That's my frustration with photography. Who cares about making a great photograph? It's not that interesting anymore." I should've given more details about the Ken Graves book. I don't like it but that's my personal preference and I don't mean to prejudice anyone else's experience. I used it as an example in the post because I think Mack went overboard with the design and it killed the photos for me. They are in a chinzy cardboard binding which is probably a historic reference to something (Japanese?) but was lost on me. The images are printed with very compressed tonal scale, full bleed, some spread across the gutter, and the whole thing won't lie flat in my lap. When I look at these images online they are beautiful. They represent the height of 70s B/W street aesthetic which I love. So it was disappointing to see these same images translated poorly into book form. Mack is usually great. Their books are usually well designed. But not this one. "very compressed tonal scale": yes, I think that was part of it. And this lacked subtlety, too. I like some books with little black and little or nothing that approaches white, but Steidl (or wherever) knows how to do these well. Here, unfortunately not. The binding didn't strike me as Japanese-inspired (though there are of course great swathes of Japanese books of which I am ignorant). Am I unusual in disliking books where one is expected to turn the pages from below to above (rather than from right to left [or, in Japan etc, from left to right])? "The Home Front" aside, there's something else that you mention: the auteur's idea that "I need image X to fill this sequence." Sometimes I reread a photobook from start to end (as I reread a novel). But this is rare. More often, having once gone through a photobook from start to end, I dart around within it. And then, in far too many photobooks, the photos that I suppose are there primarily in order to set the stage or provide contrast or whatever are just in my way as I search for the nuggets. Maybe I'm unusually philistine/myopic/foolish; indeed I hope so, because I hope that what's mere filler to me does satisfy other rereaders. On a positive/ironic note, Blake introduced me to Ken Graves to which I was interested enough in his work to order his book on Amazon. Michael David Murphy said the same. In fact Ken's giving me a cut of all the customers I send his way. Kidding, of course. Hopefully none of the above is taken as a commentary on his photos. I think they're superb. Plus he's a Portland boy so merits a special place in my heart.